And out of interest, how many of you have actually heard of Bitcoin? I only became aware of it in the last few weeks. I read techcrunch daily so I have heard of them, but yea same as you only within the last couple of weeks. The idea of an Electric based currency has been in the back of my mind for some time before i heard of them. The paper dollar is essentially worth nothing anyway and most money these days is electronic transactions of some kind so it makes sense. It's a good concept but it needs a platform and government backing to compete with the dollar and other major currencies. Sorry. As good as this sounds, at least in it's current form, economists would ridicule the idea. But maybe they're wrong, that, i don't know. While you get a lot of growth and a decentralised system, you lose stability. This system also does not get rid of inflation, as oppose to what he said. For the implementation, it would be expensive and would require a society to change in a way not observed in history. What about security issues? This system may take power from the banks but it is putting them into the hands of another group, whats not to say the banks will just take control of that group? Economics should be taught in high school, it is invaluable in understanding how the world works. I've heard people say it isn't science, but take it from someone who is about to become a scientist. It is as close as science can get to understanding that topic. Wow, that's cool. I'm not 18 yet, but I could use this for my own self profit when I do. @AsianGuy_LOL, surely when you’re in the right age you’ll either mine bitcoins or gamble with it. Most likely, bitcoiners earn bitcoin through mining, but before engaging in this kind of approach, know first if it’s really for you--http://bitcoindaily....-is-it-for-you/. Anyways, it’s quite surprising how these unemployed are surviving because of bitcoin. It still seems like everything crypto currency is just a continuation of everything that is wrong and false with the global financial system, maybe even worse. Not that it cant work in the future. Im a bit surprised im the only virtual currency hater on this whole forum. Despite new currencies, bitcoin will remain relevant because it has had since 2008 to build up mindshare, a market cap of $10 billion, and a reputation for relative stability. Investors should educate themselves on the nuances between bitcoin and Blockchain, making sure they understand the rapid pace of development in this field. Of the over $1 billion venture capitalists have invested in blockchain businesses, that funding has focused primarily on bitcoin, since for years that seemed like the only option. But with the arrival of Ethereum and a surge of alternate coins and tokens such as Zcash into the market, the landscape is looking very different from what those investors signed up for. Significant investment in bitcoin startups began in 2013, the year the value of the currency crossed the $1,000 mark before suddenly plummeting. With some wariness, investors returned and put $299 million into bitcoin companies in 2014 and $474 million in 2015. Mostly, venture funding in this period went toward bitcoin wallet and exchange startups in geographically diverse areas. These companies focused on creating on-ramps and off-ramps for using the currency in jurisdictions where such trades are legally compliant, integrating with banking systems in those locations for more efficient payment pipes. Proponents of blockchain technology and cryptocurrencies are getting ahead of the regulatory curve by introducing a self-regulatory framework from which future developments can be guided. Blockchain allows for a safe and transparent ledger platform for entities across the fields of industry, government, finance, and many more. It looks like things are moving forward for a more secure use of blockchain and cryptocurrency technologies. Just today, the world’s leading players in digital currency have partnered to create the Blockchain Token Securities Law Framework as a form of self-regulation. The partnership includes Coinbase, ConsenSys, Union Square Ventures, and Coin Center. Blockchain is a system that offers security through transparency. It’s a data structure that uses digital ledgers of transactions shared among a distributed network of computers. It’s used by digital or cryptocurrencies, the most famous of which is Bitcoin and the newcomer Zcash. Basically, transactions in a blockchain are monitored and kept by people part of a decentralized network, called miners, who store all data in blocks. Digital tokens or cryptocurrencies created on blockchains are called blockchain tokens. Bitcoin is extending a rally that’s beaten every major currency, stock index and commodity contract in 2016. Buyers sought alternative assets this week amid the killing of Russia’s envoy to Turkey and a separate attack that left 12 people dead in Berlin. 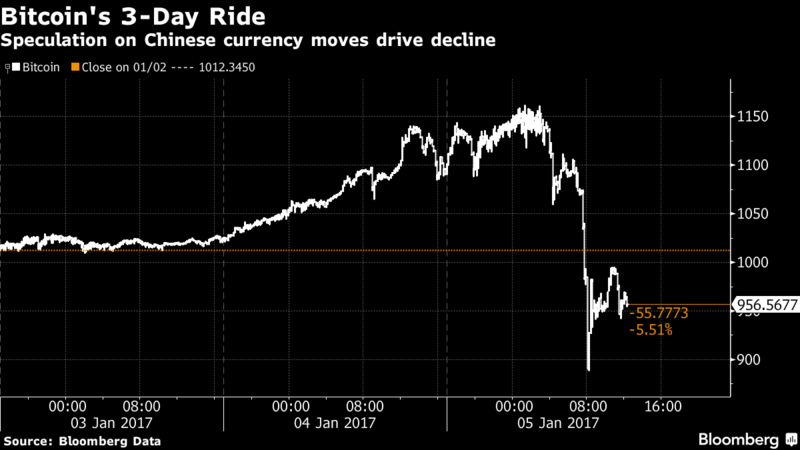 Weakening pressure on the yuan, which intensified this month as the U.S. projected a faster pace of tightening next year following Donald Trump’s election win, is also increasing demand for bitcoin in China, where the majority of trading occurs. The next time bitcoin slumps and stabilizes I'm moving some money over to it. This currency has jumped like this twice now and shown the ability to stabilize itself like it did in 2015. Not only that but Bitcoin is finally getting real recognition from financial institutions and investors. According to a Reuters report, digital currency Bitcoin grew by 125 percent to a value above $1,000 in 2016, crossing that threshold for the first time since 2013. The Bitcoin market has been historically volatile due to large-scale thefts, a sign that more safeguards must be put in place before digital currency can ever become ubiquitous. The value of digital currency Bitcoin has crossed the thousand-dollar line for the first time since December 2013. As of this writing, a single Bitcoin is worth $1114.95, growing by 125 percent in 2016 to perform better than all central bank-issued currencies, according to Reuters. Bitcoins are not controlled by any government or central authority, which makes the cryptocurrency very attractive for those looking to mobilize money without their country’s capital restraints. Reuters reports that the increase in value could be largely due to strong demand from China as a response to the yuan sinking by 7 percent in 2016. Bitcoin prices plunged as much as 23 percent from Wednesday’s all-time high, according to Bloomberg data, as some traders took gains and investors celebrated a rally in the yuan. Bitcoin fell to as low as $888.99 Thursday before inching back to $957.54. 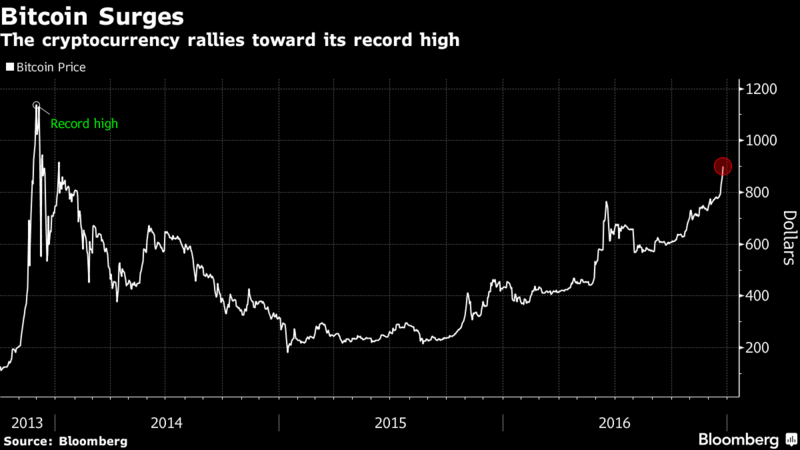 The digital currency hit a record $1,161.89 Wednesday, according to Bloomberg data, thanks to continued adoption in China and other parts of the world where traditional currencies are tightly controlled. Wall Street is finally ready to bet big on blockchain technology. Many of the world’s largest banks have already moved a sizable segment of their financial infrastructure onto blockchains, and now Wall Street is following suit, according to Monday’s announcement by the Depository Trust and Clearing Corporation (DTCC), which serves as the backend for a significant portion of Wall Street trading. The DTCC said that it’s replacing one of its central databases with a distributed ledger similar to Bitcoin’s blockchain. This ledger will be powered by IBM together with financial blockchain startups Axoni and R3. It will allow multiple financial institutions to view and update transactions at the same time. The DTCC aims to have it fully functional by early 2018. Shame, China would be so much greater and more powerful if they allowed tech and ideas to grow.